Our volunteers are passionate, dedicated and talented people. From our events like Visions, Hockey for Hospitals, TC10K, Goodlife Marathon and more, the success of our events depends on your support! We are thankful for the volunteers who dedicate their time in our hospitals and champion our mission in the community through volunteer leadership. Make a difference and join us! Volunteers: we consider you a part of our Victoria Hospitals Foundation family, and we could not do what we do without you. 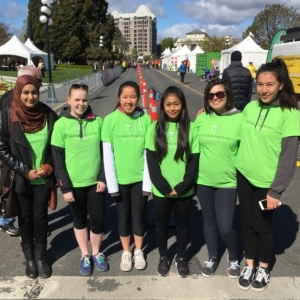 Volunteering unites everyone from our doctors, care teams, donors, corporations, and more who are looking to make a positive impact in our community. Join our team, share your experience, learn new skills and develop lasting friendships. We take volunteering seriously, and follow a thorough screening process to ensure the safety of everyone involved with supporting our hospitals. Once you are eligible to be a volunteer, your information is entered into our confidential Volunteer Database. Based on timing and capacity, you will be contacted by our Development Officer, Jim Johnstone and offered volunteer opportunities as needed. Both the Foundation and the volunteer may, at any time, decide to end their relationship. Notice should be communicated as soon as possible to our team. • We accept and encourage the involvement of volunteers at all levels, within all programs and activities. We are happy to provide students with volunteer hour credit. • We strive to create meaningful and productive roles in which our volunteers serve. We are thankful when our volunteers assist in recruitment of other volunteers in our community. • We give our volunteers meaningful assignments and listen to their needs. • As a volunteer, you maintain the confidentiality of all proprietary or privileged information to which you are exposed while serving as a volunteer. • As a volunteer, you are an ambassador to the Foundation, and represent us with professionalism. If you have any questions about our volunteer program, please contact Jim Johnstone, Development Officer at 250-519-1750 or by email at VHFvolunteers@viha.ca. Thank you for making a difference.